I wanted a contemporary example. 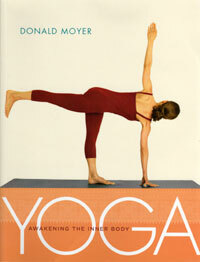 “Let’s check Donald’s book,” I said, referring to Donald Moyer’s Yoga: Awakening the Inner Body. I want to see the hands of the book’s female model, Candace Satlak, whose quiet elegance I’ve always admired. Regarding feet, rarely, if ever, do we deliberately press the toes together. We cultivate a mobile, agile, activated foot with toes spread. I’d assumed that we likewise benefit from spread-open palms and fingers, which struck me as stronger and full of life. But, for the next few weeks, I tried keeping my fingers closed. I even instructed my students to try “fingers together” to one side of a pose and “fingers open” to the other. Does it make a difference? Does it change the pose? Does either feel more appropriate for you and your body? To my surprise, I found myself liking “fingers together.” I appreciate the neat precision of fingers side by side. If I’m feeling scattered, this hand position reins me in. The orderliness in my hands somehow aligns my mind. What do you think? Is there an optimal “yoga hand”? Light on Yoga has long been my asana reference, although I’m not Iyengar trained. 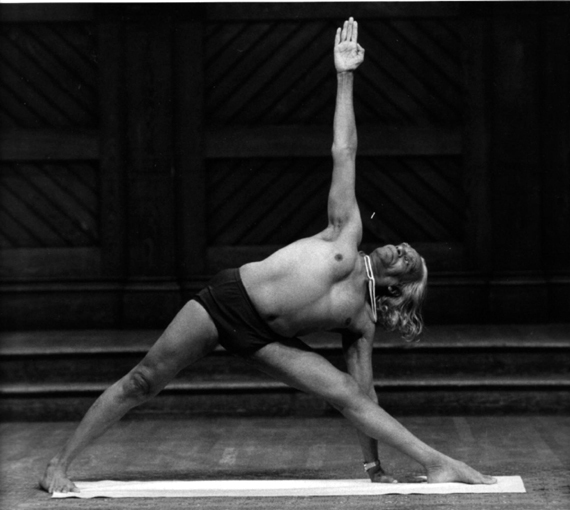 I’ve kept fingers together because of Sri Iyengar’s photos and because it just feels sharper to me. However, I’ve never looked any deeper than that until your post. Now you have me interested in how the hands work energetically in our asana practice. Thank you! I remember a teacher saying that fingers should stay open until the palms can remain open when the fingers are together. I started out practising yoga with my fingers spread like you but started keeping them together after I noticed the pictures of Guruji in Light on Yoga. I practiced with fingers together until I arrived in Canada from Chile. This change made and usually makes all the difference for me, since it releases tension from my arms, shoulders and neck. Particularly in asanas with the arms overhead, as in urdhva hastasana. Of course, this only works if you separate the fingers energetically but without creating tension. I think that we have few opportunities to open the hand and spread the fingers in our regular day. Glenda’s comment makes sense to me. Opening the palm is harder with arthritis in the base of my thumbs. Arthritis is not an excuse here in Pune: a week ago, Gulnaaz worked on my (I thought, quite well-spread) palms, kneeding the bases of thumb and fingers, saying, “This has to open, this has to open.” She taught us to spread the thumb wide to open the palm when we interweave the fingers, rotate the palm, and press the hands up overhead as if to lift the ceiling higher. I work with fingers closed. Experientially to me it feels there is a ‘seal’ in the hands this way such that the prana circulates within/is not lost. Fingers closed I feel the structure of the arms/bone body (say in vira II) extending out but the energy body flows to the end of the fingers tips and then back into the core. Thank you for giving us a yoga hand today, Luci. Oh, the hand in yoga. Look how much is said about how to hold and not hold the fingers and hands in Sirsasana. What I have observed is that when a person with stiff shoulders/upper back comes to yoga for the first time the palms are often unable to open and the fingers can be loose, or held very tight and immobile. Once the chest opens and connections between trunk/arm/hand improve, this changes. What did my first teacher Wende say about the hands when we were newcomers to yoga? She said that open fingers would help to wake up a closed chest and would move shoulders better. Now my practice is mostly with the fingers as parallel as possible to each other and only very slightly apart (except for the thumb, which is neither “sucked in” nor stretched out as wide as it can go). Back to the practice drawing board tomorrow morning – contemplating this conversation. I would keep my fingers together. Great read! Guruji’s fingers are always together, but his palm is stretched as if fingers are stretched apart. My teacher (who is a senior Iyengar teacher) says, we have to work the palms and wrists through the stretched fingers to have the extension in the palms and if we can keep that extension intact and bring the fingers together, then it is ok, but if the palm ‘collapses’, then keep the fingers stretched.